We released our SS17 Collection last week. Have you had a chance to check it out? If you haven’t, please check out our beautiful Lookbook. Let’s talk about. Aalto . Aalto is a poncho made using Twig held single. I love Twig. It creates a fabulous fabric held solo and mixes beautifully with many of our other yarns. The combination of linen, silk and wool results in a fairly crisp hand while knitting that softens significantly after blocking. Aalto is knitted on a size 6 needle, which results in an open, flowing fabric, perfect as a Spring/Summer coverup. 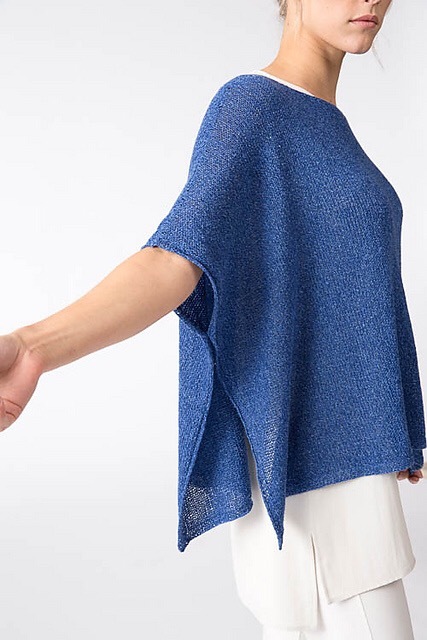 Throw it on over a tank and a pair of jeans and sandals for a casual look, or dress it up a bit as we did with an Eileen Fisher shell and pant. I think it would be lovely over a summer dress. I shaped the shoulders to give Aalto a better fit than just sewing two rectangles together. I like the way the shoulder seams lay on the shoulders and move easily with your arms, as shown in the photo above, without the extra fabric of a rectangle. The shaping and the reverse stockinette/slipped stitch edgings provide some knitting interest. Aalto is a great “first sweater” project or a perfect fairly-mindless knitting project you can throw in your bag and take anywhere. You may experience a mini (or not-so mini) freak out as you knit Aalto. Twig biases – A LOT – when knitting a lot of stockinette. But please TRUST ME when I say it will block out beautifully and will hold its shape. You will be able to see this when you wash and block your swatch. I have yet to cast on an Aalto for myself, but I know there will be one or two in my wardrobe. This is such an elegant poncho, Shellie. I love the shoulder shaping! Thanks for the heads up about the biasing–that would make me worry. My big question is what colour should I make. What a great “problem” to have. 😄 I also love how you styled it to show a dressy look. Eileen Fisher is a fabulous complement to your designs. Hmm. I just tried the link and it worked in YouTube. You can also do a search in YouTube for German Short Rows and several will pop up.